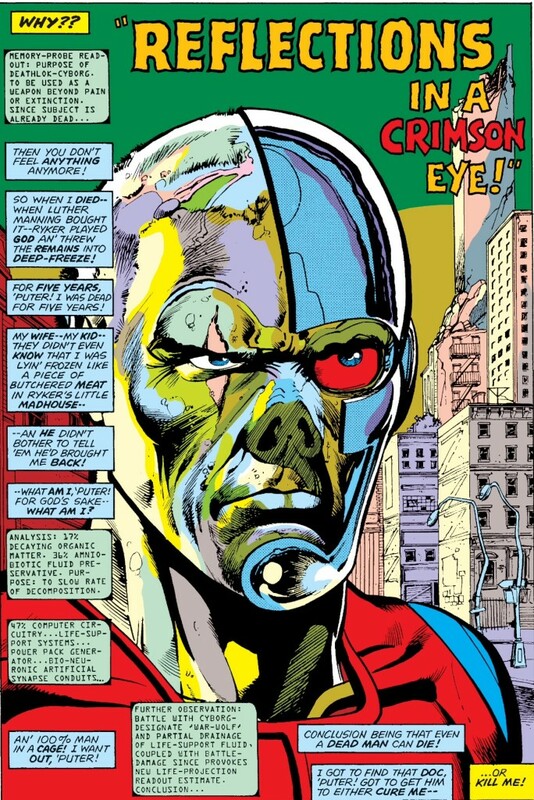 The Future in a Can: Jeff Speedreads Astonishing Tales featuring Deathlok The Demolisher - Wait, What? There are some characters that are some completely of their time they somehow manage to transcend that time entirely. 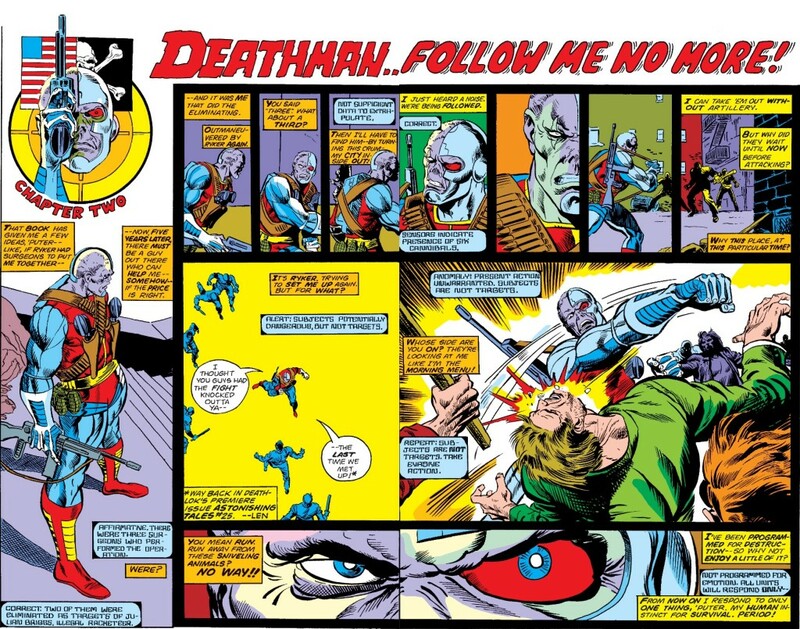 Such is the case with Rich Buckler’s Deathlok The Demolisher, whose original incarnation I revisited recently thanks to a Comixology sale. 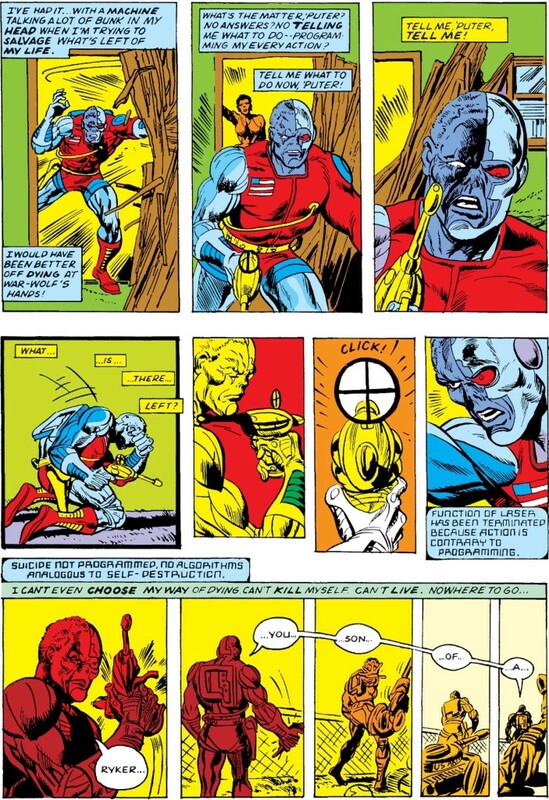 If you’re willing to accept the premise that comic books can fail at things like story and character and thematic consistency and internal logic and still be considered good, then you might find Buckler’s Deathlok to be a great comic. ….and page two, which is actually one of Buckler’s original sample pages worked into the story. Set in the far-flung future of 1990, Deathlok’s premise is a bridge between the dour apocalyptic science fiction films of the ’70s and the giddy post-apocalyptic science fiction movies of the ’80s: after being fatally injured, Colonel Luther Manning awakens to find half his body has been replaced with cybernetic parts while the other half is essentially a reanimated corpse. Initially unable to resist the control of Major Simon Ryker, his savior, Deathlok hops around a post-apocalyptic New York killing people Ryker wants dead. 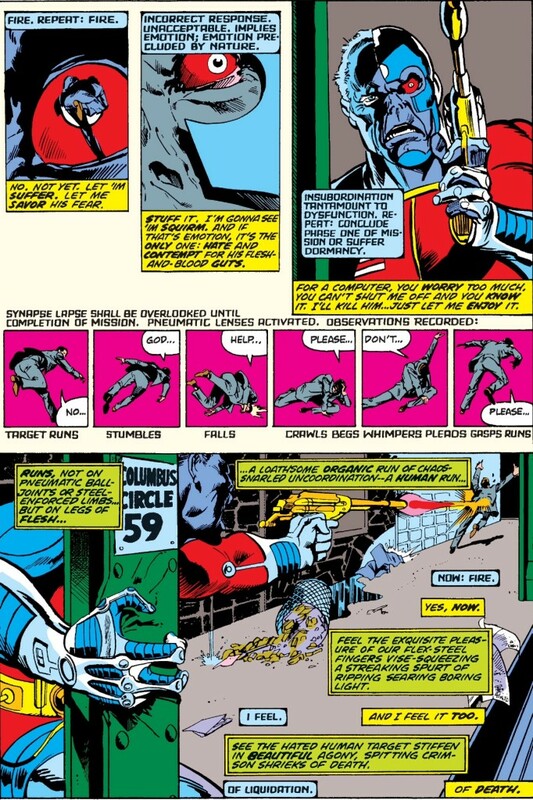 Then, after breaking free, Deathlok takes to the post-apocalyptic landscape on a variety of quests: to find the doctor who can restore him, to make the money to repair his body, to try and find his wife and child. He finds the last of these but also discovers that not only do they not recognize him (and are, unsurprisingly, terrified of them) but that his wife has married his best friend, Mike Travers. 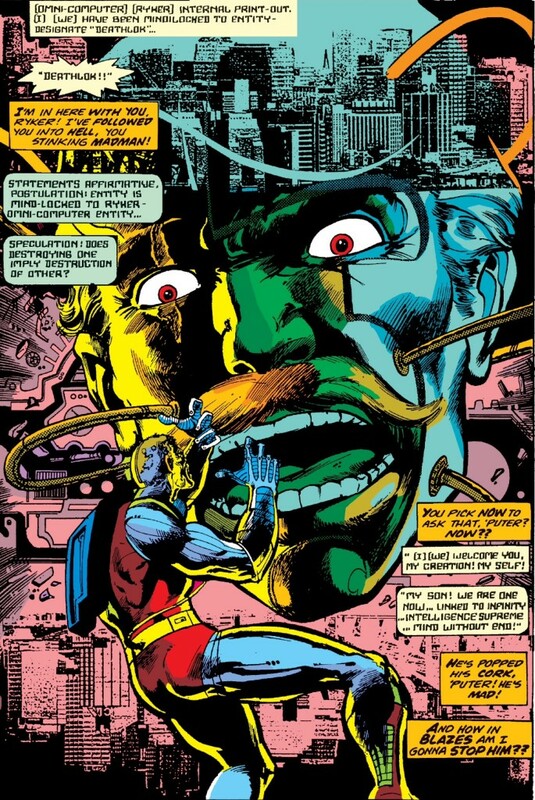 The original story runs less than a dozen issues (although one of those issues, issue #31, is only ten pages long) but manages in its short time to be simultaneously over- and underwhelming: New York has been overrun with cannibal crazies, who continually show up to attack Deathlok in the subways, and Ryker’s rogue military force, usually found lurking on every rooftop. Deathlok is being monitored by maniacal Ryker who in turn is being monitored by the mysterious Hellinger, and the first few issues bop back and forth between action in the present and action in flashback, disorienting the reader as to what’s happening when and to whom. 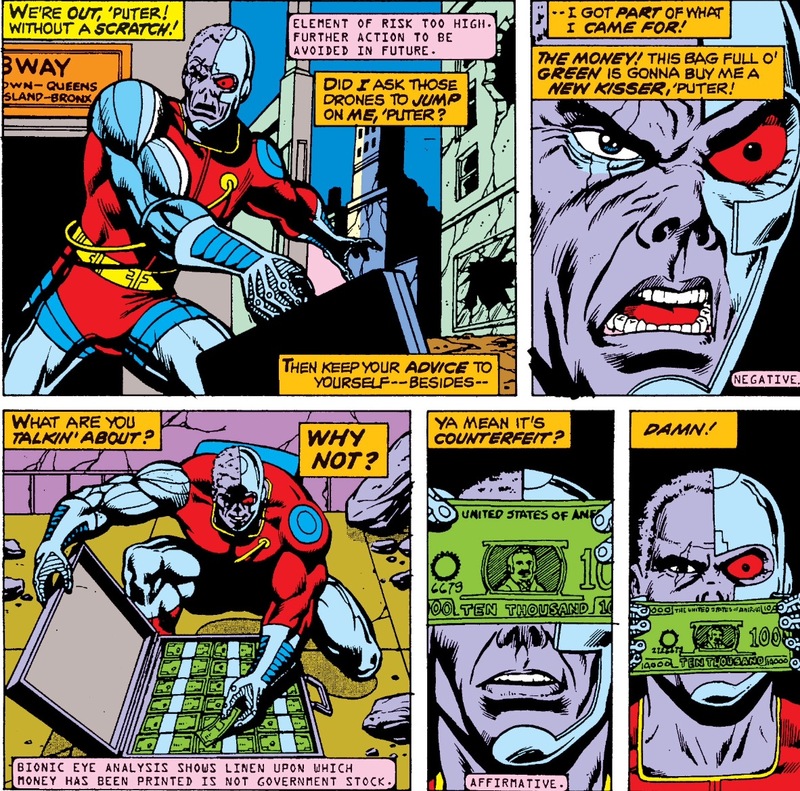 Deathlok regains his sentience while hooked up to a suspiciously crucifix-like monitoring machine, and the scene is recounted at least thrice from different angles. Buckler has no problem building his action to a cliffhanger, which he then rewinds for the start of the next issue so he can show everything all over again. And yet, even though it’s clearly a mess, it works: Buckler’s Deathlok recapture the feeling of both fever dream and nightmare, a repetitive loop of scenes that nevertheless catches the zeitgeist of the early 70s: mobs in the streets, helicopters in the skies, assassins on the roofs, while the men in control are safely locked away in rooms, covertly watching all (and spying on one another). Through it all strides Deathlok, a perfect and shockingly seamless marriage of high concepts. After all, not only is Deathlok bionic like the then-popular Six Million Dollar Man, he looks like he’s half-zombie, half-astronaut (American flag, lifeline supplying him vital fluids). He talks more than a little like Ben Grimm—Marvel’s go-to voice for its antiheroes—but his misanthropic despair is closer to that of Charlton Heston in Heston’s great trifecta of grim post-apocalyptic films Heston of the late ’60s and early ’70s: Planet of The Apes, The Omega Man, and Soylent Green. 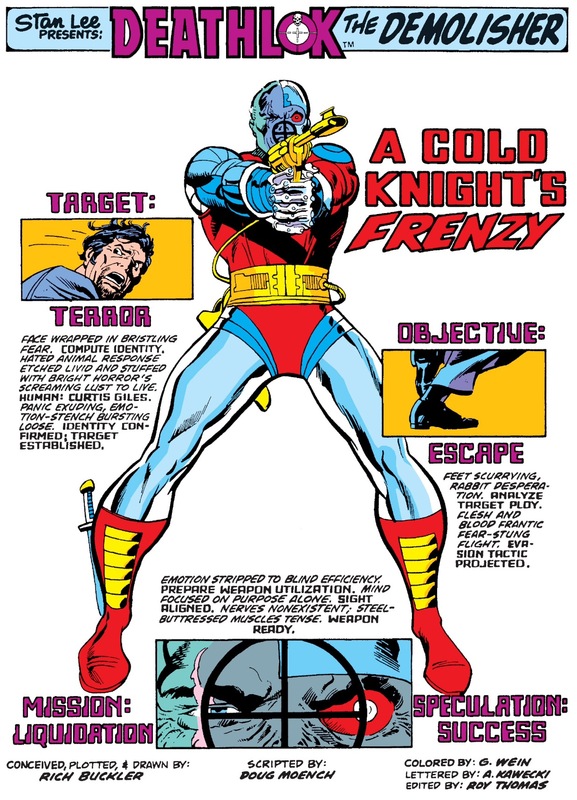 Deathlok is swarmed by violent crowds like Neville in The Omega Man (and, like Neville, his love interest is Black), skulks through shabby city streets and slaughterhouses like Thorn in Soylent Green, and falls to his knees and pounds the ground in anguish like Taylor in Planet of the Apes. 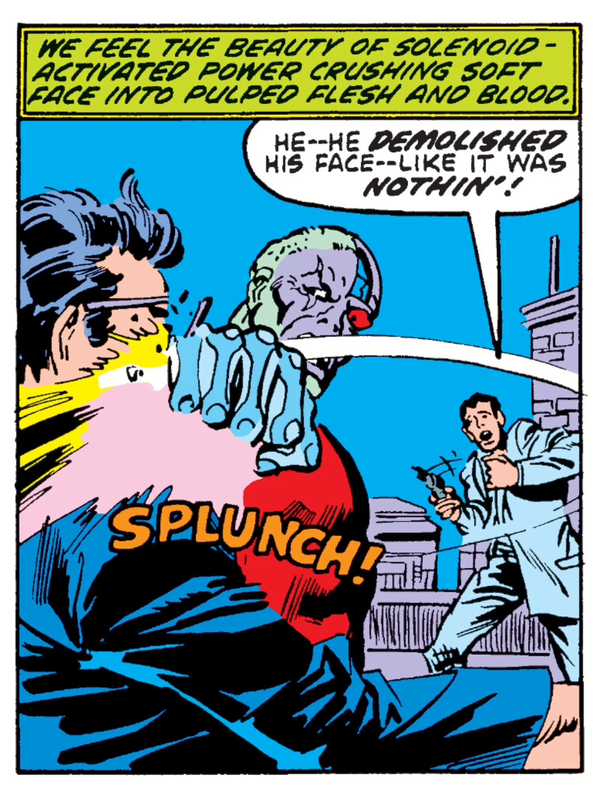 And yet, by the time Deathlok falls to his knees, tucks the laser gun under his chin and pulls the trigger, Buckler has moved the character far beyond the histrionics of either The Thing or The Chuck. 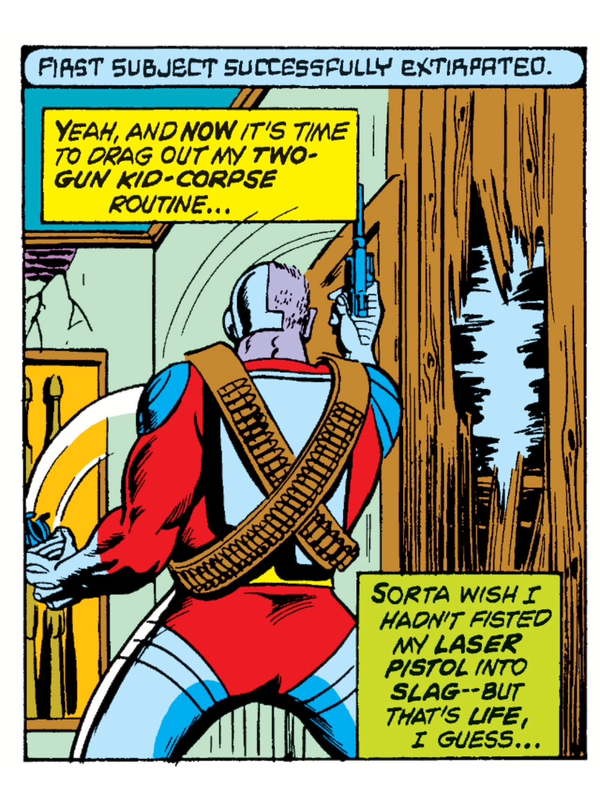 (Deathlok lives because suicide is against his computer’s programming, and the laser pistol duds out.) The heroic self-pity at the core of men’s adventure stories has been reduced to a black and bitter crust. And it’s hard to tell if Buckler’s Deathlok was influential or merely prescient, but on rereading I was struck by how you can spot the band of crazies in Carpenter’s Escape From New York (1981), the premise of a good man slaughtered then rewired to a computer to become a tool of the military-industrial complex in Verhoeven’s Robocop, the close-cropped hair and baleful glare in Miller’s Road Warrior (again, 1981). But the similarities were strong enough that while re-reading these issues, I had to remember that they came first. Oh, right, and the movie Lawnmower Man! How’d I forget that one? When Deathlok gets shunted back into “the present” of 1976 and is reprogrammed to kill the President of the United States, a violent killing machine from the future, you might even think of Cameron’s The Terminator (1984). By that point, however, Buckler’s hold on Deathlok was loosening and then apparently let go entirely: thanks to Marvel’s Deathlok the Demolisher: The Complete Collection , which collects all of the appearance of the Luther Manning Deathlok, you can see how Buckler goes from creator of the series in Astonishing Tales to listed as one of four artists for the Marvel Spotlight issue (where Deathlok is launched back in time), to being nowhere in sight from Marvel Two-In-One #27 where The Fixer and Mentallo program the cyborg to assassinate Jimmy Carter. According to Buckler, a move from New York back to his hometown of Detroit put him on the losing end of political battles for the fate of the character, the stress all but crippling him with severe migraines. By the time Mark Gruenwald and Ralph Macchio demolish the Demolisher in another issue of Two-In-One (27 issues after issue #27), Buckler is at DC, a long way from the Sterankoisms of Astonishing Tales, the Kirbyisms of FF. One wonders if that “out of court battle” had happened by then, or if Buckler saw money from that issue, or when J.M. DeMatteis and Mike Zeck brought back the unconcluded storyline at the end of 1983 and gave it an ending in Captain America #286-288. Anyway. The future is long in the past now. Deathlok is on TV and back in comics (in what I think is his fifth incarnation). He’s been used brilliantly (although the fanboy in me was hand-wringy about a new person becoming Deathlok, I adored how Dwayne McDuffie used the character as a commentary on being black in America) and he’s been used poorly. Buckler has moved on from indirect surrealism—although the first issue’s reference to Dali’s Christ of St. John of the Cross was intentional—to direct surrealism. 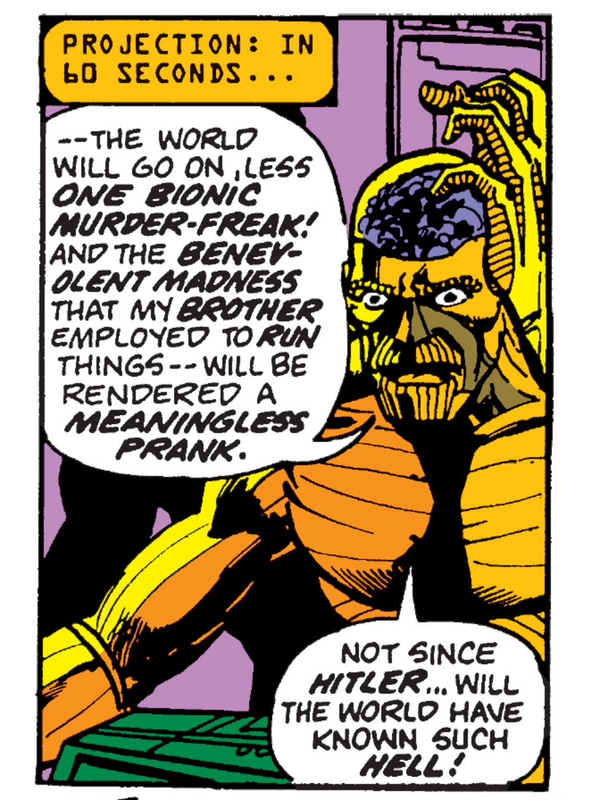 It’s tempting for me to play the bitter card and comment on the irony of Deathlok, the man struggling not to be an object, now being purely dehumanized object, but honestly I don’t know about that. All I know is once, a long time ago, a handful of comics came out and they were a chaotic, baffling mess, both challenging and deeply challenged. Day For Night: Jeff Looks at The Four Issue Run of Night Nurse. More than a little Deathlok in the Deadshot that resurfaced at DC a few years later. 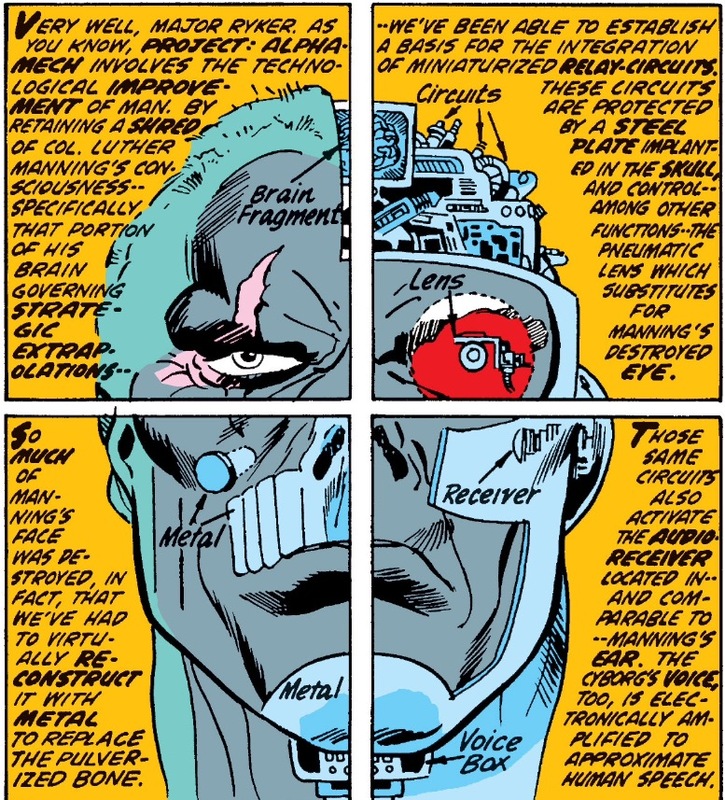 Never noticed that before, never really noticed Deathlok before. Huh, good point! I just reread the first reappearance of Deadshot not more than a week after I read these and I didn’t even notice. Good catch! Thanks Jeff; I’ve been meaning to hit the button on Comixology for this run for awhile, and you’ve convinced me it’s the right thing to do. Despite my luv for all things Bronze, I’ve never actually read these (bar the first issue in one of Marvel’s 1970s collections). I’ve always liked Buckler, despite the bad name he garnered for his swipes, because he pretty much (as you said) encapsulated the Marvel House Style of the 70s with his Kirby, Steranko and Buscema influences. Unsurprisngly, when he returned to Marvel in the 90s (on a few Limited Series with Roy Thomas) his style had morphed again. I like that kind of chameleon aspect – which is why I still dig Giffen. Hmm, the comparison with Giffen is a very interesting one, Terence. 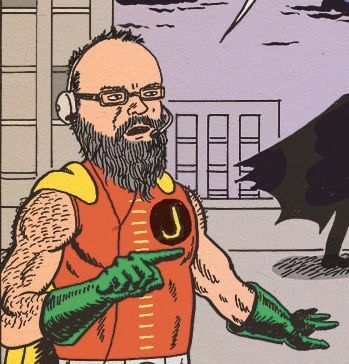 I do feel like Buckler has probably morphed into a more “traditional” stylist…but definitely when you compare their bad history with The Comics Journal, they do seem to have a lot in common. Thanks! Does the trade have Buckler’s Marvel Masterworks introduction? He talks about prescient it was politically (and he did appreciate the DeMatteis resolution). Which…. yeah. I would argue this is the best Buckler’s art ever looked, especially with the Janson inks. The layouts have a janky, broken feel to it that really gets you into the story… but the story feels incomprehensible most of the time. Classic case of reach exceeding grasp. Yeah, they’re a mess…but they end up being way more interesting to me despite their clear and obvious failures. Frankly, I’d argue they’re more coherent than when Steranko started the Nick Fury title (although that really isn’t saying much, I know). This is great! As a kid of the 70s, I loved the weird series the most — Deathlok, Killraven, Skull the Slayer. Thanks so much for this article, it was a fantastic read. My pleasure! Considering you mentioned my 70s Marvel trifecta, we’re clearly on the same page. Thanks for commenting!